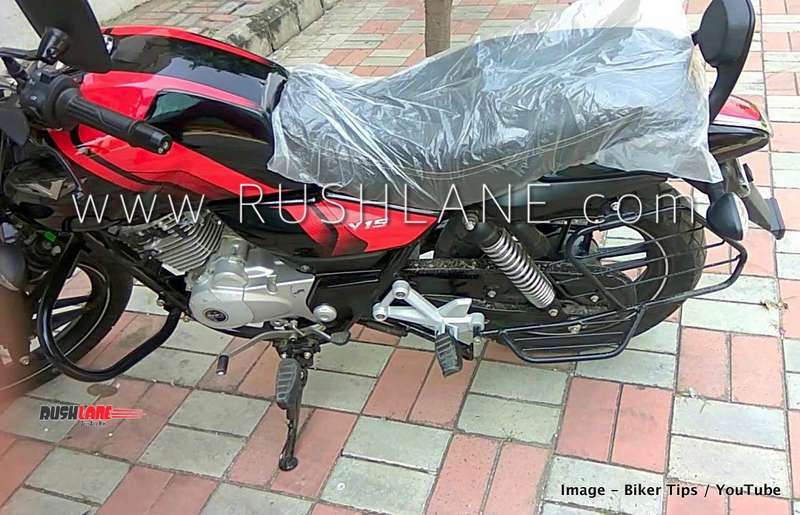 The Bajaj V15 gets updated for the 2019 model year. Misses out on ABS. Hat tip to automotive enthusiast biker tips Youtube channel for sharing the video. 2019 Bajaj V15 with cosmetic as well as mechanical updates has been launched in India. It is priced from Rs 65,700, ex-showroom. It does not get ABS yet. Expect the ABS variant to be launched by March 2019. For starters, the 2019 Bajaj V15, which also gets its commemorative plaque on fuel tank from the INS Vikrant, is seen with cosmetic changes among which are new colors, body graphics and minor touches. 2019 Bajaj V15 will continue with the same dimensions as seen on its current counterpart. It will measure 2,040 mm in length, 785mm in width and 1,069mm in height. It gets wheelbase measuring 165mm and seat height at 780mm, fuel tank of 13 liter capacity and kerb weight of 137 Kgs. The current Bajaj V15 is powered by a 149.5cc engine offering 12 PS peak power at 7,500 rpm and 12.7 Nm torque at 5,500 rpm mated to a 5 speed gearbox. The updated 2019 Bajaj V15 gets a more powerful engine which now delivers 13 PS and 13 Nm. In comparison, it is about 1 PS and 0.3 Nm more powerful. Top speed has been increased to 110 kmph. You can watch the walkaround and top speed video below. Transmission is via the same 5 speed gearbox as before. But, there is also a change in the shift pattern of gear system. Earlier Bajaj V15 featured all up-shift gear system. Now, it is similar to Pulsar’s one-down, four-up system. In the front, 2019 V15 gets telescopic forks, while at the rear it has gas charged twin shocks. Other feature updates include addition of better padding on the seats, a backrest for pillion, graphics have been slightly changed, the red colour is now more brighter, etc.